Greatest entrepreneur of the 21st century for sure. 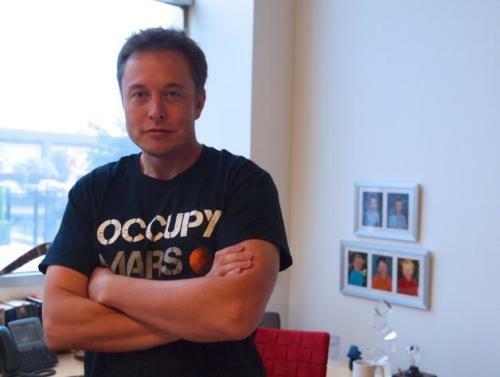 Gotta love Elon Musk and others like him. In 50 years even an average person can afford a vacation on mars. "Our astronauts will also find time to relax. They can do most of the indoor activities that people can do on Earth: read, play games, write, paint, work out in the gym, watch TV, use the Internet, contact friends at home and so on. There will be some communication and media limitations, due to the distance between Earth and Mars, resulting in time delays: they will have to request the movies or news broadcasts they want to see in advance. If an astronaut would like to watch the Super Bowl, he or she can request it, and it would be uploaded to the server on Mars. There will always be a time delay of at least three minutes, so the people on Mars will know who won a few minutes after the people on Earth. Hopefully this slight delay will not spoil their enjoyment of our ‘Earth sports’. Easy Internet access will be limited to their preferred sites that are constantly updated on the local Mars web server. Other websites will take between 6 and 45 minutes to appear on their screen - first 3-22 minutes for your click to reach Earth, and then another 3-22 minutes for the website data to reach Mars. Contacting friends at home is possible by video, voice or text message (e-mail, WhatsApp, sms), but real time dialogue is not possible, because of the time delay." Man, i'd sell all my possessions for an opportunity to move to Mars. Just make sure you activate the terraforming pyramid. I guess you mean "meteorites". Asteroids couldn't be stopped even by Earth's atmosphere (and even by Venus'). No, it couldn't. Martian atmosphere is 60 times less dense than ours (1.225 kg/m3 vs 0.020 kg/m3), this means a dynamic pressure of 100 m/s (360 km/h) wind on Mars is the same as 13 m/s (46 km/h) wind on Earth. It's difficult to say what is an asteroid and what isn't... how small does something have to be before it is not considered an asteroid anymore? Is an object 10 meters wide an asteroid? That would easily be stopped by Earth's atmosphere. So drawing the line between asteroid and meteoroid, and meteoroid and dust is not very simple. Mars' atmosphere can block small meteoroids though, just as Earth's can. a big sand storm could destroy all us "houses"
No. The materials that Martian habitats would be made out of would likely be similar to materials that would be used to make other space habitats, which are designed to withstand impacts by micrometeoroids and orbital debris. Even the most violent sand storm would pose no risk to the shelter at all. In Russian tradition, boundary passed somewhere around 10-50 m radius. Tunguska was nearly 50 m and considered as meteorite though. That sounds like a reasonable size cutoff.